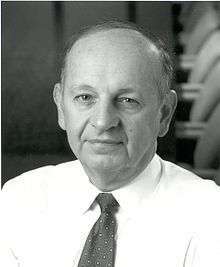 George Harry Heilmeier (May 22, 1936 – April 21, 2014) was an American engineer, manager, and a pioneering contributor to liquid crystal displays (LCDs), for which he was inducted into the National Inventors Hall of Fame. Heilmeier's work is an IEEE Milestone. Heilmeier was born in Philadelphia, Pennsylvania, graduated from Abraham Lincoln High School there, received his BS in Electrical Engineering from the University of Pennsylvania in Philadelphia, and his M.S.E., M.A., and Ph.D. degrees in solid state materials and electronics from Princeton University. Heilmeier had received numerous awards, held 15 patents, and was a member of the National Academy of Engineering, the Defense Science Board, and the National Security Agency Advisory Board. He served on the board of trustees of Fidelity Investments and of Teletech Holdings, and the Board of Overseers of the School of Engineering and Applied Science of the University of Pennsylvania. He died of a stroke in 2014. Dr. Heilmeier, the son of a janitor, was the first member of his family to finish high school. His daughter, Beth Jarvie, said “it was the Christian character of my dad” as well as his ability to put his head down and push forward with the work at hand that played major roles in his contributions. ↑ "Milestones: Liquid Crystal Display, 1968". IEEE Global History Network. IEEE. Retrieved August 4, 2011. ↑ "The George H. Heilmeier Faculty Award for Excellence in Research". University of Pennsylvania. Retrieved 26 April 2014. ↑ G. Heilmeier, "Some Reflections on Innovation and Invention," Founders Award Lecture, National Academy of Engineering, Washington, D.C., as published in The Bridge, National Academey of Engineering, Winter 1992. ↑ "John Scott Award Recipients 1991-2000". John Scott Award Advisory Committee. Retrieved February 22, 2012. Oral history interview with George H. Heilmeier, Charles Babbage Institute, University of Minnesota. Heilmeier describes his introduction to the Department of Defense as a White House Fellow assigned to the Office of the Secretary of Defense working in the Office of the Director of Defense Research and Engineering. Most of the interview is devoted to his years as Director of the Defense Advanced Research Projects Agency (1975–1977).